Bijou beauty or mediocre miniaturisation? In truth, there's a bit of both in the PowerShot N, Canon's truly compact compact. On the whole, though, this clever re-imagining of how cameras should look and perform puts the bias strongly towards the former. It's larger than its most obvious rival, the Nikon Coolpix S01, which by comparison sheds around 1cm in both height and depth. The Canon weighs almost twice as much, too, but in return is more versatile and better suited to all-round use. 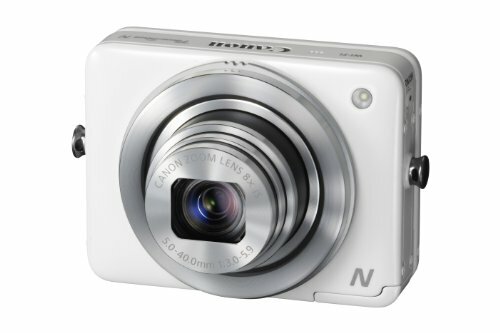 Where the S01 has captive memory and a 190-shot battery, the PowerShot N uses microSD for storage and has a squared-off AA-size cell that Canon claims is good for 200 shots. It's charged in situ, unfortunately, which puts the camera out of action the whole time it's charging. You can buy an external charger if you want to charge one battery while using another. It's rather less conventional than the S01, too, with several obvious nods to larger, less technical cameras of old. For starters, the zoom control is attached to the lens surround, where it also encloses the shutter release. The two controls use a pair of rings, with the zoom ring slightly larger and set behind the shutter release. Twisting the zoom moves the lens in and out, with the full range equivalent to 28-224mm on a conventional 35mm camera - or an eight-times zoom. It's fast, but a little noisy, and as there's no option to switch off the digital zoom it's easy to unintentionally slip past the 8x end point, even with speedy reflexes. Pushing the shutter ring up or down towards the centre of the lens takes a picture. It's a lot easier than it sounds, and even when wearing thick insulated gloves we had no trouble either using the controls or keeping the end of my fingers out of the frame. The same can't be said for the buttons ranged ranged around the sides, which cover off power, playback and Wi-Fi. These are small and fiddly. There's a 2.8-inch touchscreen around that back that flips up from the body by 90 degrees. That's a bit half-hearted, as it's not sufficient to help when taking self portraits, but at least the bidirectional shutter control does mean that if you want to take pictures over people's heads you can simply flip the whole camera upside down and carry on as usual, with the screen effectively pointing downwards. The UI is smart enough to reorientate itself in this position to keep everything upright, and images are flipped before being saved. It also has built-in Wi-Fi that lets you manage your images remotely using an iOS or Android device, and tag them with GPS locations using your device's integrated location services. The business end is a 12.1 megapixel backside illuminated sensor that puts out 4000 x 3000 pixel images. Maximum sensitivity is ISO 6400, but you'll need to use it with care, as grain started to become visible in our test shots at ISO 400. However, the grain was light and even, and fine detail such as the writing on a regular Sky remote remained legible. It was still legible even at the highest setting – ISO 6400 – but by this point detail was being sacrificed elsewhere, with darker areas in particular being less distinct, and the edges of lighter elements lacking crispness. We performed our outdoor tests under bright, clear skies and although blues and greens were well handled, some natural reds were a little muted. In more complex shots, some fall off in the level of focus was also evident when moving away from the centre of the frame, at the point where the lens had to work harder to bend the incoming light to reach the sensor. This was particularly obvious on grass and stones, even when the aperture was set to f/9.0, which will have increased the depth of field. There was also some barrel distortion evident when shooting a test grid. However, there was no evidence of colour fringing on sharp contrasts, and with a minimum focusing distance of just 1cm, macro performance is naturally strong, with good details and an appreciably shallow depth of field to draw the eye. The widest aperture positions sit at f/3.0 and f/5.9 at the wide and telephoto ends of the zoom respectively, but as with most of the settings on this camera you can't tweak the aperture manually. Neither can you set the shutter speed, which ranges from one to 1/2000 second, so unless you're happy to confine yourself to using the six built-in scene modes, which supplement the regular auto, program and hybrid auto (a stills/movie combo) there's not a great range of options for more creative photographers. Shooting movies couldn't be easier. There's no dedicated video mode, so you can start recording in any of the regular shooting modes, with support for Full HD – 1920 x 1080 at 24fps. Rather neatly, if you've selected the miniature photo style, which emulates a tilt shift lens, you can set the movie to play back at five, 10 or 20x regular speed. Results are generally good, with a very clear soundtrack picking up plenty of accurate ambient noise. However, it also picks up the sound of the zoom mechanism, and if you let go of the zoom ring when you've finished moving the lens rather than guiding it home you can hear it snap back into place. Images are bright and detailed, though, and colour reproduction is good. It also compensates well for sudden changes in the level of available light, with finely-stepped adjustments. However, this is accompanied by a light ticking sound as it shifts the internal aperture. Overall, it's a slightly mixed bag. The unconventional body shape performs surprisingly well, and Canon's re-imagining of how a compact camera can and should work has been successful. Indeed, it's been so successful that it might have been more appropriate to make this the basis of a new Ixus line, rather than slotting it into the PowerShot line-up. Build quality is excellent, although image quality leaves a little to be desired in some areas, with a fall off in focus towards the corners of the frame and some noise in the output at higher sensitivities. If you want a truly pocketable compact this is a good choice, although at £270 it feels a little overpriced, however innovative the design.